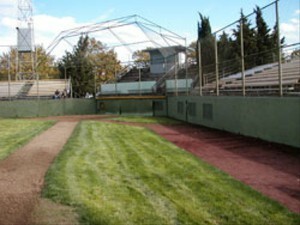 Walker Stadium at Southeast Portland’s Lents Park. will be part of a summer wood-bat league that’s trying to attract some of the best college players from around the country before they go pro. The new team will play up to 30 home games per season at Walker Stadium in Southeast Portland’s Lents neighborhood. City and League officials have plans to renovate the stadium, adding 500 seats and concessions. The plans go hand-in-hand with the city’s urban renewal goals for Lents. Portland Mayor Charlie Hales said this type of baseball is a natural for the city. “This community-scale sports franchise approach I think is right for baseball now in Portland, and the Lents Park Walker Stadium location is a perfect fit,” he said during a press conference Tuesday. Portland’s most recent minor league team, The Beavers, was sold in 2010 and moved to Tucson, Arizona. That came after the city of Portland decided to convert what was formerly PGE Park into a soccer-only stadium to make way for the Portland Timbers MLS franchise. The Portland Baseball Team is calling on would-be fans to help choose a nickname for the team from six options, including the Portland Pickles, Red Dogs, Pliers, Mud Hounds, Pixels and Posse. The team will play ball starting in June of next year.